Hello, and welcome to the Sword of Nerdom podcast! What’s all this, then? This program is what one would call an “actual play” tabletop RPG podcast. What that means is that we’re playing, recording, editing, and sharing our current Pathfinder RPG campaign in podcast form for your listening pleasure. Sword of Nerdom was originally a nerdy blog created in 2014 by Celeste & Budd as a place to share their love for tabletop rpgs, cosplay, films, and all things nerdy. As time passed, our interest in blogging fell off and it was retired, but in its place rose the idea of sharing our tabletop RPG adventures with the rest of the world- and thus was born the Sword of Nerdom Podcast! As a change of pace from our last several campaigns, which took place in more traditional high-fantasy settings full of elves and dragons, we decided to steer our debut campaign for the podcast in the direction of a relatively low-magic, dark fantasy world full of untrustworthy nobles, a corrupt and all-powerful church, and things that go bump in the night. Thus was born Strova- a dark, grimy city built on twin hills on either side of a dark river, where unsavory characters slither through winding alleyways and towering, gothic spires loom overhead. You’ll follow along as our intrepid heroes journey into the seedy underbelly of this “City of Shadows,” solving mysteries, uncovering conspiracies, and beating up and/or getting beaten up by monsters of all sorts. Along the way, dice will be rolled, rules will be mangled, and there will be horror, action, comedy… and more than a little drama. 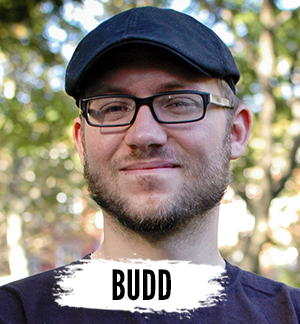 Budd is a lifelong nerd and aspiring fantasy novelist. His “four pillars of nerdom” are Godzilla movies, professional wrestling, wuxia/martial arts cinema, and of course tabletop role-playing games like Pathfinder. He has been GM-ing for about six years now, and thoroughly enjoys world-building and giving his players a hard time while chickening out of killing off their characters. He currently works at one of those fancy major book retailers while trying to make time for his many hobbies and getting this whole “writing” thing off the ground. 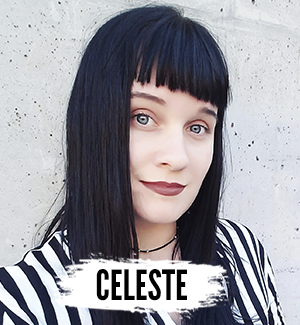 Celeste first began her nerd journey, as many of us do, through the discovery of manga and anime. It wasn’t until 2012 that she was introduced to the world of tabletop rpgs and Pathfinder. It’s since grown to be one of her favorite pastimes. This gothy lady runs on dirty chai tea lattes (always iced) and is fond of dark fantasy novels, the occult, and all things spooky. When she’s not working as a graphic designer she’s usually working on a new cosplay, taking photos of other cosplayers, or catching up on k-dramas. Justin was an average kid academically who was only interested in getting by in school and had no interest in doing anything more until 1994. That was the year he discovered comic books, video games, and action figures which soon took high priority in his life; which shaped much of his personality. So much so that when he got his first job he would spend close to his entire paycheck building his collection. When he’s not almost getting himself (and others) nearly killed in Pathfinder, he’s gaming, playing with his figures, attempting parkour, and stuffing his face with his all time favorite food…Chinese! 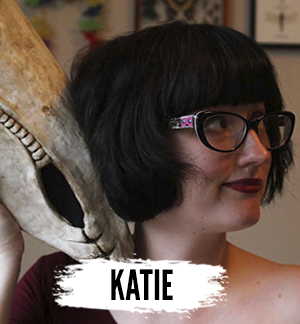 Katie is a 2D artist, game developer and badass Mundane. She spends her days digitally painting, sentencing dice to Dice Jail, and getting chewed on by her bird son, Inko. She’s currently working on an adventure game called The Wishing Well. It’s spooky and weird and there’s a fancy dress party with murder and stuff. She survives on a steady diet of tacos, cheap wine, podcasts and K-Dramas. Anthony is originally from Northeast Georgia. An aspiring chemist, he currently works in restaurants. He started on his nerdy path with Power Rangers and Digimon. Heroic tales like Redwall, The Chronicles of Narnia, and Harry Potter gave him a lifelong joy of reading. He got through high school by mostly having his nose in a book. Anthony finally got into tabletop rpgs after Budd and Celeste invited him into a new campaign. Now a player and a game master, he is learning more about Pathfinder everyday. Anthony is also the main chef of the podcast. Nico is an artist and bookstore inhabitant who formerly haunted the mountains of North Carolina. When she's not playing video games or chatting with her garden plants, she can be found hanging upside down from steel poles and lengths of silk or inventing new vegan recipes. This active lifestyle is fueled by children's cartoons, true crime podcasts, fantasy novels, and brazen but adorable witchcraft. 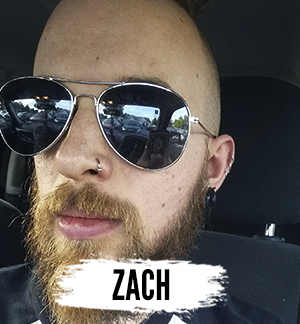 Possibly engineered by Aboleths throughout an elaborate series of genetic experiments gone awry, Zachary spends much of his time playing, planning, and running pathfinder campaigns. He has dipped his hands into D&D off and on since 2008, when he discovered some 3.5 edition books neglected in a thrift store. After this forbidden knowledge was etched into his brain, Zachary was unable to find his way out of the abyss of monsters, magicians, and murder. He also has a few side hobbies such as writing poetry, short stories, novellas, and stupid posts on instagram. Oh and he builds computers... and paints... and plays tons of video games. Basically, Zachary doesn’t sleep much, but then again, maybe he wasn’t designed to.